This is our custom-built Mogami 2319 with 1/8"-3.5mm locking to TS 1/4" for Sennheiser wireless systems with an instrument. This is a custom cable similar to Sennheiser's CI1-N or CI1-R that connects an instrument like a guitar or bass to a wireless bodypack. Construction is Neutrik and Switchcraft connectors with Mogami 2319 cable. Neutrik and Switchcraft connectors are some of the best connectors around. Mogami 2319 cable is very flexible, durable, light-weight cable. For any Sennheiser pack that uses the locking 1/8" connector. May be compatible with other brands that use the same connector and pinout. Not compatible with Freeport systems, if you have a Freeport system let us know when you order and we can change the pinout. Photo 1 shows 2' cable with Gold TS 1/4" and 1/8" and blue shrink label. 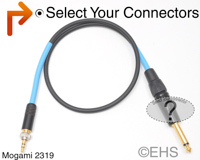 Photo 2 shows one option for the cable with Gold TS 1/4" and 1/8" blue shrink label.